This study evaluated the Cornell Net Carbohydrate and Protein System (CNCPS) for dairy cattle consuming pasture-based diets. 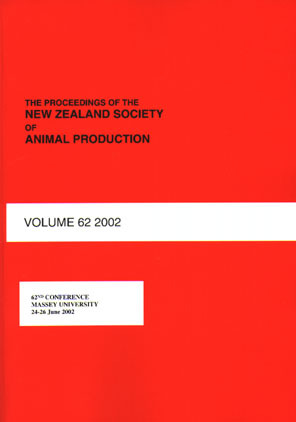 Data was obtained from four grazing, and four indoor pasture feeding experiments (23 dietary treatments) with dairy cattle in New Zealand and the United States. ME requirements for maintenance were adjusted to account for grazing activity. The model gave a reasonably good prediction of changes in condition score (R2=0.79, slope not significantly different from 1), energy balance (R2=0.76, slope not significantly different from 1), blood urea nitrogen (BUN) (R2=0.91, underprediction bias of 0.4%), microbial nitrogen flow (R2=0.83, slope not significantly different from 1), and milk production. The model underpredicted DM intake (R2=0.80, 11% bias), and overpredicted ruminal pH (R2=0.47, 1.8% bias). These results indicate that the CNCPS can be used to make realistic predictions of ruminal fermentation and performance of dairy cows offered good quality pasture.